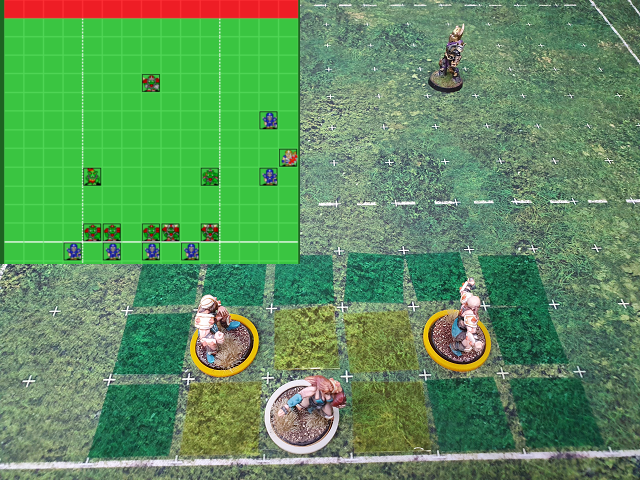 In Blood Bowl, one of the first tactics most players are introduced to is the cage, and for good reason, because it’s one of the most effective ways of safeguarding the ball while advancing down the field. However, often the match situation doesn’t allow for a controlled grind, be it through lack of time or lack of players, and sideline cages are one of the most common methods of progressing in those situations. Now as the name suggests, a sideline cage means a situation where the ball carrier finds themselves either on or very close to the touchline, and accordingly one of the greatest dangers of this kind of offense is that the carrier (and quite often his or her support players) might be pushed off the pitch and into the crowd (and thence swiftly to the injury boxes), and so this article is going to address some common sideline setups and also how to avoid or mitigate the danger of being ‘surfed’. 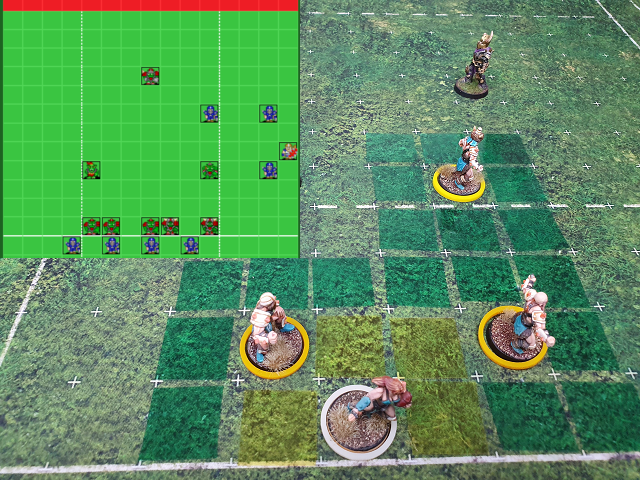 As with many pieces of tactical advice in blood bowl, these things tend to vary considerably depending on what race you are playing – and what race your opponent is playing, and to add even more complexity, what skills are in play, but we are going to start with some simple examples and then talk about how race and skills can influence these situations. 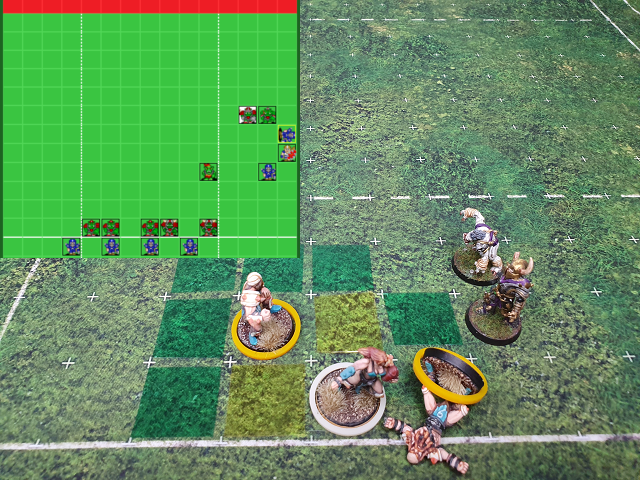 When the Orc Blitzer blitzes here, with his team-mate positioned as shown, a push of any kind still surfs the ball carrier. Now although this is only a 1d block, the chances of getting the pushback are 67% without reroll, and a whopping 89% with. Arguably if you are forced into this kind of desperate breakaway situation, leaving the possibility of 2d is almost certainly a better option than giving a very likely surf. Where the lead edge of the cage is pushed an extra square forward (in fact some might argue at this point it has become a screen and not a cage), and we’ll talk in a minute about why you might or might not want to do that. But our original example is a nice compact cage that prevents any block on the ball carrier without a dodge, and if the coach does want to make that dodge it is going to be quite difficult as it requires dodging into three tackle zones. For an AG3 player that requires a roll of 6, and even for AG4 it’s 5+. At the same time, if your opponent does want to make that dodge they also need to negate your assists unless they want it to be a -2d block, so this humble little cage does force a few problems for an opponent. A negative of the second example, the extended cage/screen, is that a player attempting to dodge into base with the ball carrier is only dodging into two TZ’s, a significantly easier dodge. Now surfing is the most extreme pitfall of sideline caging, but knowing that your main aim is to score, your opponent will often not take the risky play to go after the ball but instead simply try re-establish their defensive line or make base contact with your carrier and present you with a headache. 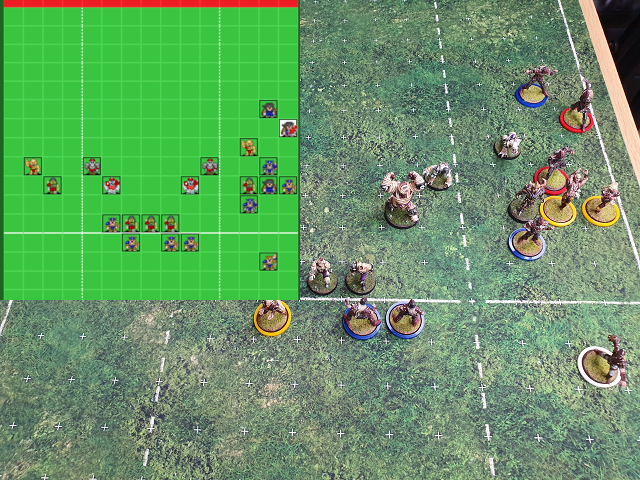 The Orcs can easily generate a 2d block here, and having knocked the lineman down, the Blitzer can either follow up and base the Catcher, or retreat to try and form a screen. Depending on the exact starting positions of the defenders, the amount of movement they have and so on, there are many lines of play that can develop from a situation like the above. 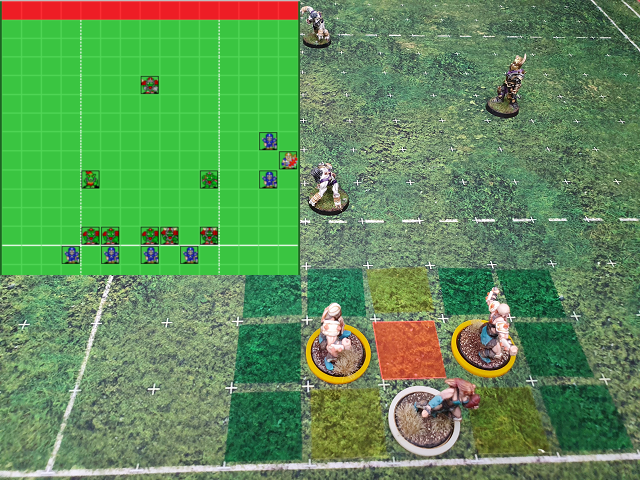 What is clear is that the situation can very quickly become quite claustrophobic, and turn into a situation in which you find yourself needing multiple 1d blocks and dodges to get to the endzone. So one reason to try the screen/cage variation is to mitigate this a little bit. Not only does this provide exactly the same difficulty for your opponent to dodge in, and not only do you have one player who is a square closer to the end zone (sometimes one square makes all the difference! 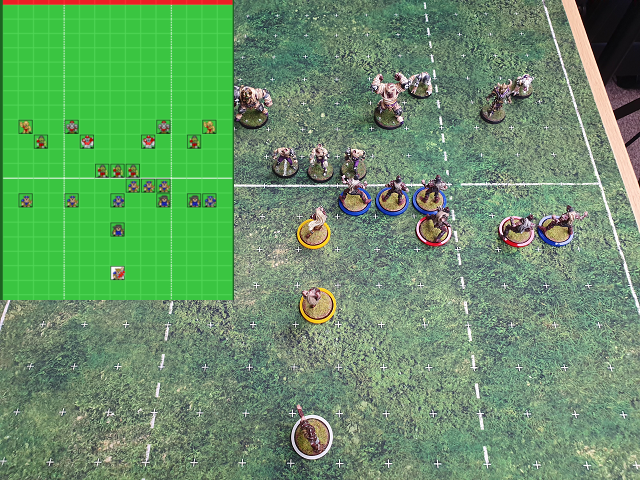 ), but it also makes it that little more difficult for the opponent to crowd your players, giving you more options. In the examples above a key thing to remember is our TD attempt is still on. Even in those scenarios in which someone is basing the ball carrier, we still have a chance to dodge and blitz out, even if it seems unlikely. So the cage has helped us toward our goal and given us a chance when we might not have had one. Again at this point we enter a realm of infinite possibility and the exact way you choose to position will depend on your race, your skills and those of your opponent, but don’t forget your primary goal and the examples we have looked at that show how your opponent is likely to try and stop you achieving it. That means your first priority is to minimise their opportunity to get bodies in contact with your ball carrier or to surf it. After that your priority is to prevent them from cutting off your own advance or creating a solid defensive screen. Anything that achieves the first goal and helps towards the second is a sound formation. Ag3 teams can try the same tactic but will be looking at 3+ dodges for the players following the blitz, which is obviously significantly more risky (66%/78%). ST4 teams can make the 2d block on the outside without an assist, which again allows for other players to follow easily. Versus the second defensive formation above, we have a bigger problem. There is no way to break stacked defenders in one turn without simply dodging past the second player, and unlike our previous example we don;t have an empty square to dodge in to, so even for AG4 that means a minimum 3+ dodge. At this point we might want to give up on the sideline cage, depending on the urgency with which we need to score, and try a centre-field cage instead. 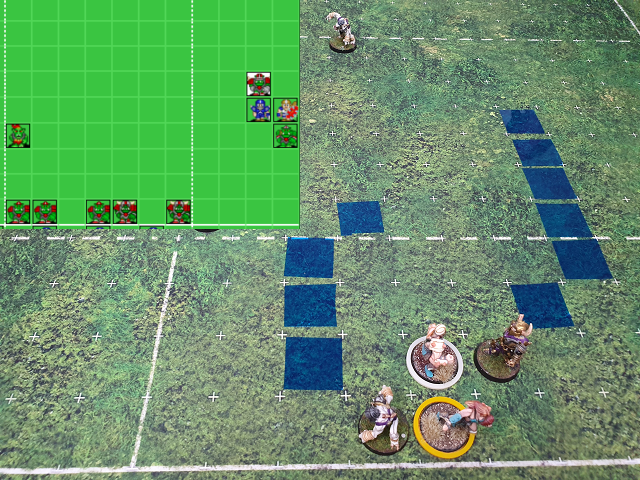 If we have three or more turns, the sideline remains an option, but we will instead be attempting to peel the layers away, again attempting to capitalise on the inability of the opponent to reinforce the position with his spread out players. This will clearly depend on the opponent’s race and movement. Your team’s race has a huge bearing on the above tactics through the combination of stats and skills it provides. At the same time you will be considering your opponents capabilities through the same lens. We’re going to look at skills in a minute, so I’ll focus on how statistical variation affects your approach. Probably the most powerful stat when trying sideline breaks is movement. The more MA you have, the further downfield you can position your cage, and the further your next-turn-scoring threat extends. As we saw in the examples above, the ability to get extra players involved in our cage and to help create screens around it can make a huge difference to how secure it looks and whether our opponent is able to respond. Clearly high movement helps all of the above. One issue many teams have is a significant disparity in MA between different positionals on the team, e.g MA4 Zombies and Flesh Golems vs MA7 Ghouls and MA8 Werewolves on the Necro team. In normal cages this generally means everyone moving at the speed of the slower players so as to keep a cohesive unit, but when looking to make a sideline breakaway, we want to prioritise the fastest players to extend the front edges of our screens and cages downfield, and use our slower players to cover the backend and primarily tie up opponents. This will give the greatest opportunity to rework our plans on the fly and means even if things go wrong we have multiple (scoring) options available. 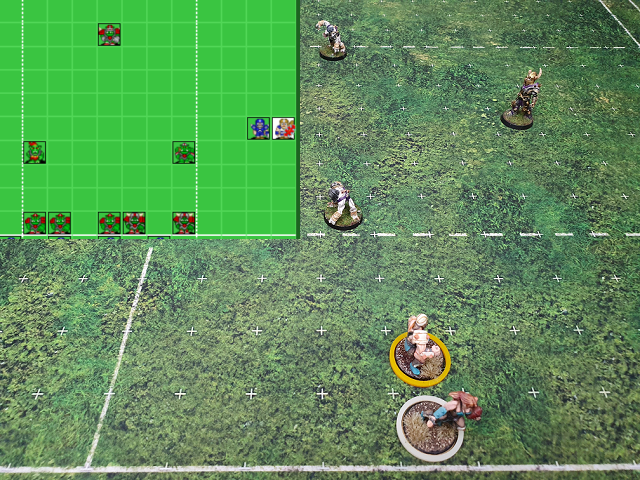 Agility is the Swiss Army Knife of Blood Bowl, and as we’ve seen in some examples above it can be huge both in finding your way through opponent defences and re-positioning your players. It can also be used against you to dodge into your cages and to re-position against you. AG4 is the normal tipping point where the excessively risky becomes the reliable, but AG3 stunties and other AG3 players with dodge should all be considered when evaluating your position, and we’ll look at them in a bit more detail below. Sometimes it seems anything is possible when playing high agility teams, and given the normal combination of high AG and high MA, these can be amongst the foremost exponent of the sideline arts. When playing against AG4 opponents you are very likely to see the stacked column defence, and are likely to either have to force spaces through attrition or rolling some tough dodges. Thusfar we’ve seen the power of speed and guile in creating sideline scoring threats, but muscle is not to be underestimated even in our approach. Even if our sideline cage is a bit more mobile and temporary than the typical cage, we still need to anchor it. Strong players can be a huge asset in preventing knockdowns and pushbacks on the edges of our cage, and mean that our ball carrier is less likely to be based by opposing players or that our path to the endzone is less likely to be obstructed. Moreover we can more reliably create 2D blocks and blitzes on our turn in order to clear any defenders in our carriers’ way. Two great exponents of this art are Lizardmen and Necromantic teams, who have the ST4 Saurus and Flesh Golems respectively to make great cages and allow their speedy team-mates options to score. Big Guys are often valuable in the same way, but as always, beware their inconsistency. Now let’s take a look at some of the skills that very commonly come into play when making (and breaking) sideline cages. We’ll start with Sidestep. This is particularly good for players that like to hang around the edges of the pitch. With Sidestep on your ball carrier, the opportunities to surf them are far fewer. Even better, if your ball carrier is pushed and not knocked down, you have a chance to move even closer to the endzone. Sidestep on your carrier’s supporting players can also be very useful as it can help to avoid the congestion that can occur when they are blocked, and limit your opponent’s ability to bar your way. Beware of opponents with the Grab skill, as this cancels your sidestep skill and means you can be positioned and surfed normally from blocks. This can also occur if the squares surrounding your side-stepper are filled. This means your player has fewer valid places to step to, or may even mean it can be surfed. 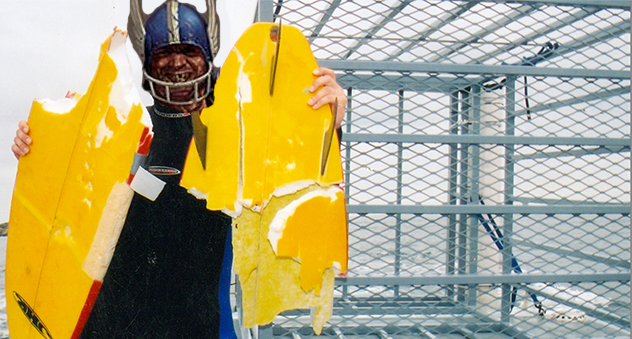 It’s not very common to find ball carriers with stand firm, but it does mean that conventional surfing is impossible. As with Sidestep, Stand Firm is very useful on supporting players, as it means your cage cannot be disrupted. Even better, without pushbacks, blockers can not follow up into base-to-base contact with your ball carrier. Beware of opponents with the Juggernaut skill – this cancels Stand Firm. Now we’re going to look at a skill that can create massive problems for sideline cages. 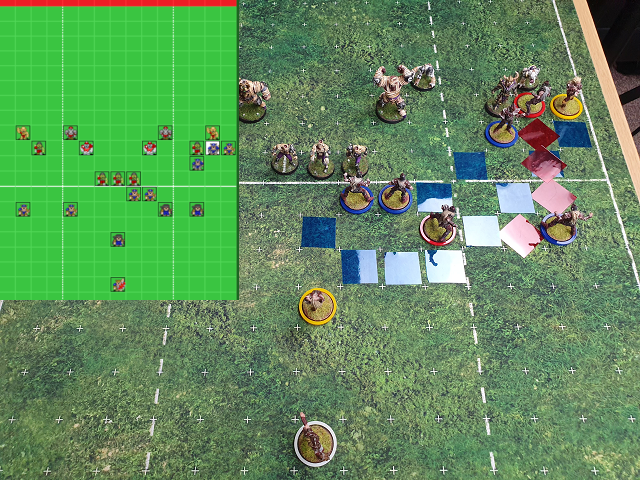 Anyone who has played versus frenzy knows that just about any player hanging around the sideline becomes a potential surf target, and it can be extremely difficult to remember to play around this for a whole game of blood bowl. Frenzy is not only dangerous because of direct pushes on the carrier, but also because it can very easily create chain pushes using the other members of your cage or screen against you. As a result, frenziers must be either directly marked or kept as far away from any sideline cages as possible. 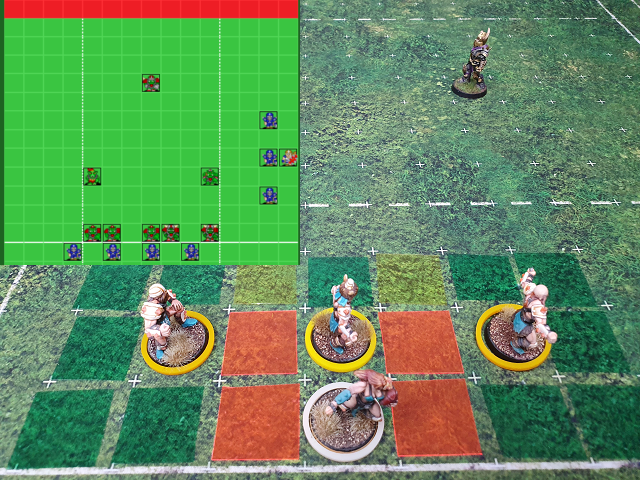 Many a frenzy player has fallen foul of failing GFI rolls when over-reaching on blitzes. 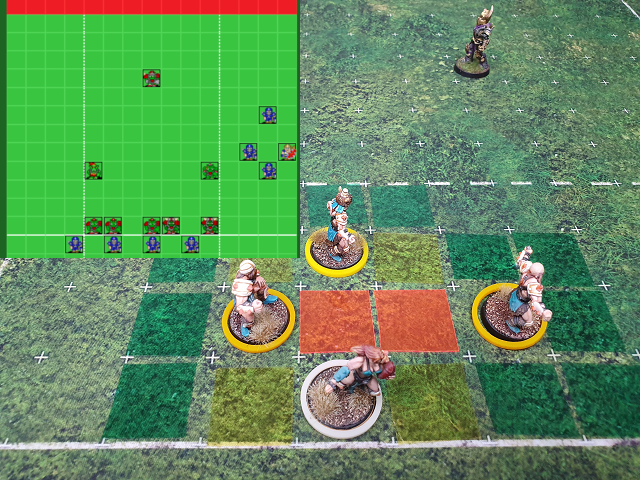 Stunty and the diminutive weak players it is normally found on might not seem an obvious threat to your cage, but because of the ability it gives to make dodging through multiple tacklezones easier, it can markedly increase opportunities to try and surf you. In the simple setup, a dodge from a Goblin, Hafling or Skink that ends in a -2d block will still surf on 40% or 61% with a reroll. that is actually higher than the chance of an elf to dodge in and surf with a 1d block. Typically seen on big guys, Break Tackle is often used to cage dive, and the sideline is no exception. The primary defense against Break tackle is to create situations in which the user needs to make two dodges, as Break Tackle can only be used once per action. That means either marking the BT’er to force a dodge to begin the turn, or to create a double screen between the BT’er and the ball. Leap is the bane of cages pitch-wide and the sideline is even more vulnerable to aerial attack. Unless your ball carrier has Sidestep or Stand Firm there is very little you can do to prevent surfs if your ball carrier is hugging the touchline in a traditional sideline cage. When facing such opponents, looking at some kind of screen or layering defences to force dodges is your main tactic. That’s the end of this brief primer. There is a ton of further nuance and complexity to discover and consider when attacking via the sidelines, and there are many variations and positions that can develop from the illustrative examples we have looked at above. I’d love to hear your thoughts on any particular situations or setups that you have come across, and I hope this helps some of you to keep walking the line.